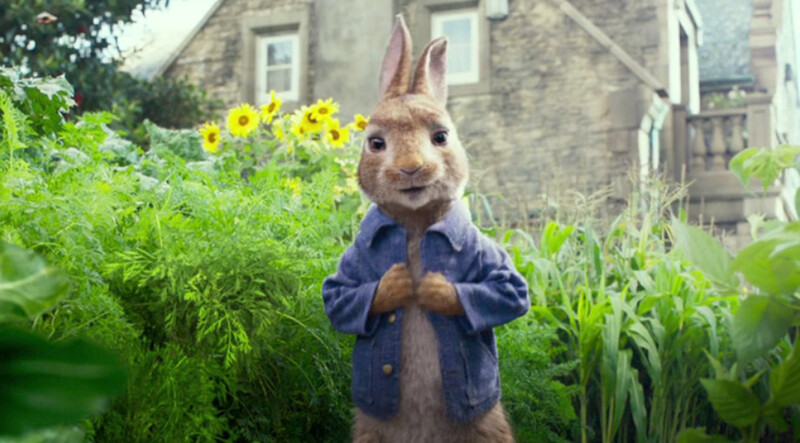 Peter Rabbit (James Corden) is a naughty little critter, easily identifiable by his little blue jacket. His favourite activity in the world is eating vegetables, and more often than not that involves sneaking into the garden of the often exasperated Mr. McGregor (Domhnall Gleeson). He takes his friends along with him – some of which you’ll definitely recognise from Mrs. Tiggy-Winkle the hedgehog to Mr. Tod the fox – and together they have a whale of a time with an all-you-can-eat buffet of lettuce, carrots and tomatoes. When Mr. McGregor returns home one day to find his garden ransacked and his house littered with leftovers, he thinks things couldn’t get any worse. That is until he realises that there are a load of anthropomorphic animals hiding in his furniture. By the looks of things, he’s not the furious farmer we read about in the original story – rather one of Peter’s poor victims. But we’ll soon discover what happens to the rebellious buck, and whether or not he learns his lesson about stealing from people’s gardens. Beatrix Potter’s world famous children’s characters have been brought to life in this wonderful CGI / live action comedy ‘Peter Rabbit’. Directed by the Golden Globe nominated Will Gluck (‘Friends with Benefits’, ‘Easy A’, ‘Annie’), who co-wrote the screenplay alongside Rob Lieber (‘Alexander and the Terrible, Horrible, No Good, Very Bad Day’), the film is based on the original 1902 story ‘The Tale of Peter Rabbit’ – with a humorous modern twist, of course. The story has been adapted to television numerous times in animation, and there was also the 1995 musical film ‘The New Adventures of Peter Rabbit’, but this is the first time the lovable bunny has been brought into a live action setting. ‘Peter Rabbit’ is set to be released in the US on February 9th 2017.